Instant Pot Refried Beans: Save yourself time and money with the easiest, tastiest refried bean recipe ever! Pressure cooker refried beans are sure to become a staple in your kitchen! Two years ago if you asked me what is the one canned good you would always find in my pantry would be, I would tell you beans. I ALWAYS had canned beans and refried beans stocked up for easy dishes like Black Bean Tacos, Sweet Potato Black Bean Chili, and Mexican Quinoa Salad. Now thanks to my Instant Pot I have said good-bye to canned beans and only stock dried beans in my pantry. Dry beans are not only much more affordable, they are also so much better for you than canned beans. I just never relied on them as a kitchen staple BEFORE my Instant Pot because of the time it took to cook them. Once I realized how easy it was to make Instant Pot Dried Beans WITHOUT soaking, well I was sold, hook, line and sinker. Instant Pot Beans is now one of my go to Instant Pot recipes, but so is my Instant Pot Refried Beans. So it is high time I shared with you all my recipe for refried beans made in the pressure cooker. Just like whole beans, refried beans are a staple at my house. From bean burritos, to Mexican Pizza, to Easy Taco Dip, refried beans find themselves into my recipes quite often. Of course refried beans are also great to serve alongside dishes like Instant Pot Pork Tacos, Instant Pot Steak Fajitas or with Taco Grilled Fish. Sure there are great quality canned versions of refried beans on the market. BUT when I can make tastier, healthier refried beans for pennies, homemade is the way to go. This recipe for refried beans is BEYOND easy. Step One: Place beans and liquid in inner pot of instant pot. Step Two: Add in desired seasonings. I prefer to use Taco Seasoning for my refried bean recipe. Step Three: Place lid on Instant Pot and set cook time for 50 minutes. This is DOUBLE the cook time than dried beans require, but this is so the beans get SUPER tender and are really easy to blend. Step Four: Once cooking time has elapsed, let pressure NATURALLY release. This can take up to 30 minutes. It is really important to NOT do a quick release, as this will change the texture of the beans. 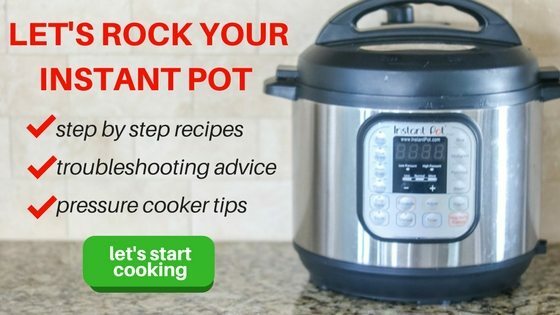 The same is true for rice, stock and tough meat–find out more about NPR at Instant Pot 101. Step Five: Blend the beans with the cooking liquid. 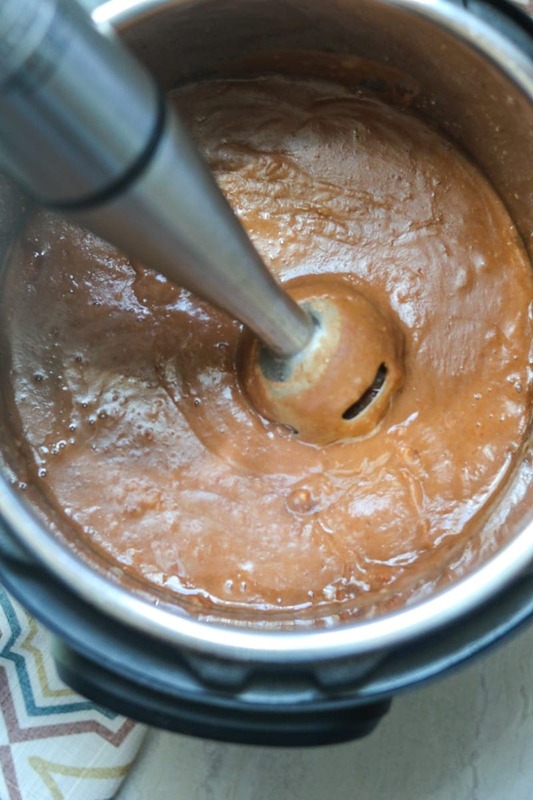 You can use a hand held immersion blender OR a food processor. I prefer to make a large batch of refried beans and then freeze for future use. Cook refried beans as recipe directs. Allow refried beans to cook. Place in 1 cup portions in either freezer safe bags or small plastic containers. You can thaw refried beans in refrigerator overnight or remove from plastic container/bag and defrost in microwave. You can also put frozen beans into a oven safe bowl (remove from plastic bag/container first) and place in your instant pot’s inner pot on a rack. Pour in 1 cup water under rack and cook on high pressure for 10 minutes, this will defrost and heat 1 cup portions of refried beans. Refried beans will keep in freezer for 4-6 months. I prefer to cook my dried beans in Instant Pot Chicken Stock for flavor, but use vegetable stock for Vegan and Vegetarian Refried Beans. You can make refried beans with pinto beans, black beans, or small red beans. Feel free to omit the onion and garlic from this refried bean recipe and just use taco seasoning or seasoned salt. Store leftover cooked beans in the refrigerator for 5 days or in 1 to 2 cup portions in freezer safe bags/containers in the freezer for up to 6 months. The easiest, tastiest recipe for homemade refried beans. Place all ingredient in inner pot of Instant Pot. Cook on high pressure with valve turned to "seal," and set to cook on high pressure for 50 minutes. Allow pressure to release naturally (about 30 minutes). Remove lid and then blend with an immersion blender or food processor, until smooth. 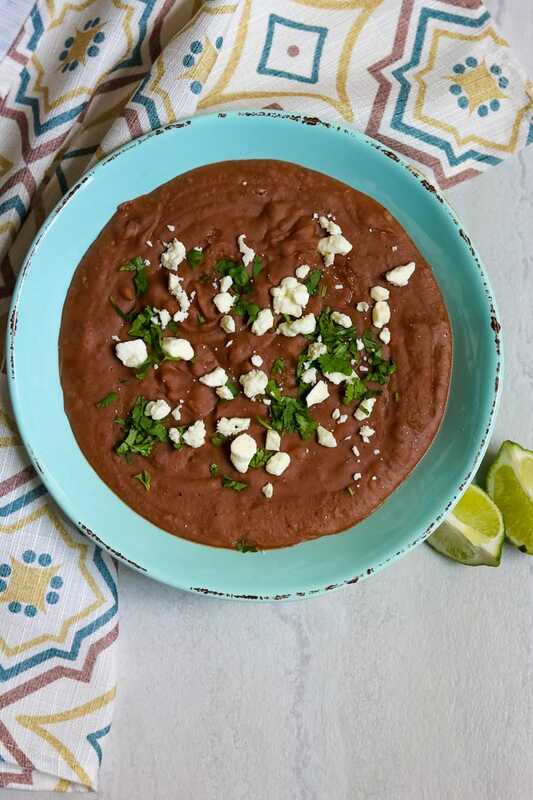 You can use pinto beans, black beans and small red beans for this Instant Pot Refried Beans. Use chicken stock, vegetable stock, or water. If you use water, add an additional teaspoon of taco seasoning beans. I was so excited to find this recipe!!! I am always conscious of using tinned products so I knew I had to try this! Oh Claire that makes me so happy! So glad you enjoyed! I am glad I found your recipe for refried beans as our stores just about never have stock and besides homemade is always healthier ! Oh yes, this is so much healthier (and tastier) than store bought. Enjoy Linda! Worked like a charm!! Local walmart stopped carrying vegetarian refried beans so I gave your recipe a try. I liked the addition of taco seasoning. I think it really gave it flavor. I didn’t measure beans to water so I did drain off a lot of water, however I kept it to use as stock for other meals. I am SO glad that you found this recipe to replace your vegetarian refried beans. I hate when stores stop carrying products, but homemade always tastes better anyway! Hi, First I just wanted to thank you for your excellent recipes, I have pinned so many of them looking forward to trying! I am new to the Instant Pot and today I am making your instant pot pinto beans. I want to try this refried bean version as well. Question, why do these beans cook 20 mins longer than the regular pinto version? Does this help with the smashing later? Thank you so much. Thank you Gina!! Yes, you want to cook the beans longer so they are soft enough to mash. The regular instant pot beans are cooked through but still too firm to completely turn to a smooth refried texture. Let me know if you run into any issues or have any questions! Need some help, please. Followed the recipe as written but ended up with 8 cups of brown broth, not refried beans. Ant thoughts on what went wrong or how to salvage? Frustrating to think it’s going to end up down the drain! I am so sorry–this does make looser refried beans, but should not be liquid. Did you used canned beans or soaked beans? That would change the how much water is needed in this recipe.